You've now added Chocolate Museum to your itinerary. Kick off your visit on the 14th (Sun): see the interesting displays at Chocolate Museum, look for gifts at Old Town (Altstadt), take in panoramic vistas at Rhine Tower (Rheinturm), then take in the views from Hohenzollern Bridge, and finally take in the spiritual surroundings of Cologne Cathedral. Get ready for a full day of sightseeing on the next day: get in on the family fun at Phantasialand. 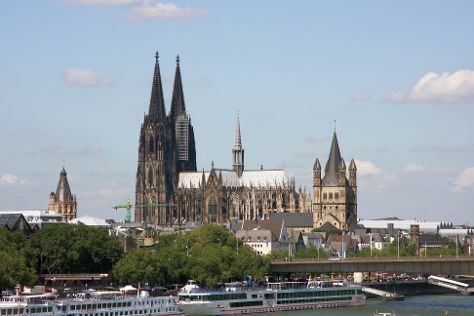 For photos, ratings, reviews, and other tourist information, you can read our Cologne holiday builder app . If you are flying in from United States, the closest major airports are Düsseldorf Airport, Cologne Bonn Airport, Dortmund Airport and Weeze Airport. In October, daytime highs in Cologne are 59°F, while nighttime lows are 46°F. Wrap up your sightseeing on the 15th (Mon) early enough to travel back home.